How long do bacteria live on a surface? Do antibacterial soaps effectively kill bacteria? Where is the most bacteria in your school? Which door handle in the school has the most bacteria? Does toothpaste kill bacteria in your mouth? Do dark socks create more bacteria in a shoe than white socks. Which surface cleaner kills the most bacteria? In the right conditions, the bacteria usually starts growing in 4-5 days. Components are non-sterile and are not intended for medical use. For ages 8 and above with adult supervision. Brandon from South Carolina used this kit to test whether or not double-dipping a chip spreads bacteria. His mom, Amy, writes: "My son won 1st place overall for his school!!! He wowed the judges and now is heading to the local University for the area competition in three weeks. I am so glad you were able to assist us. Thanks again and we look forward to working with your products in the future." Congratulations Brandon! What to do with my cultures when I am finished with my experiment? When your experiment is complete, always dispose of your cultures properly. Always destroy the microorganisms before disposing of dishes in the trash. Have an adult pour a small amount of a strong disinfectant such as household bleach over the colonies while holding the Petri dish over a sink. Caution - never allow any strong disinfectant such as bleach touch your skin, eyes or clothes. It may burn! Always get help from an adult. Which area of your school has the most bacteria? Shannon K. writes: Some of our over achievers from my sons class! These are after a week. We enjoyed seeing whose mouth was the dirtiest. The cool weather caused a slower-growing project than we hoped for, but it still won 1st place at science fair. The agar bubbled over much faster during prep than the instructions warn. Watch it closely! Easy to use and directions were user friendly. My son had a science project to do and we ordered these, they work just like they said they would! Pretty neat to grown your own bacteria! My daughter did a project on bacteria on school water fountains. (Bleck). It was great, the instructions were clear. I only wish it had some handout on the different kinds of bacteria and what to look for. Quick delivery, easy to set up, allowed my 3rd grader to have a very positive first science fair experience. We used this product for science fair and got 1st place!!!!!! I recommend!!!!! The product was easy to use and made the project a great success! This product works great for the experiment I did. I followed the directions and I got what I needed. 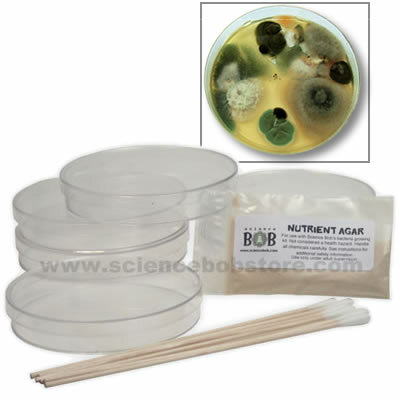 If you ever need to grow bacteria, this is the kit to buy. This is the second kit I've purchased and both have worked perfect with easy to follow instructions and fun ideas this kit is worth its wt in gold. The kids had a blast testing stuff around the house and watching the results grow right before their eyes thx for a great product. Much better than any project I did as a kid. Easy to follow instructions.